Srilaxmi Sales Corporation is the leading Ashirvad CPVC Pipes Dealers in Hyderabad. Srilaxmi Sales Corporation is run by the visionary Mr.Sampath Reddy who with his leadership skills and smart work make the company the Chairman's Club member. Srilaxmi Sales Corporation the Ashirvad CPVC Pipes Dealers in Hyderabad is having the stocks of the Ashirvad CPVC Pipes in good quantities to supply it to all the pipe needs. 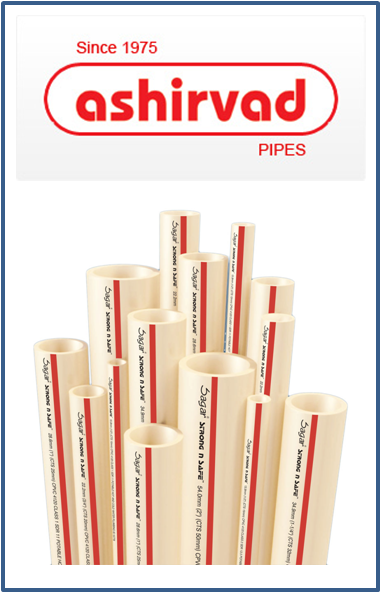 The Ashirvad CPVC Pipes are available in many sizes and are available at a customer friendly price. The Ashirvad CPVC Pipes has longer durability because of its best quality.